LG is busy this time of the year, in addition to rolling out their LG6 flagship phone with a big installment promotion deal at Sprint, they are now offering their new flagship computer monitor for pre-order for $999. The 32-inch LG 32UD99-W has 4K UHD (3840 x 2160), IPS, HDR-10 For PC, DCI-P3 95% Color Standard, FreeSync support, and various connectors. It has a “1 to 4 weeks” shipping estimate at Amazon by Amazon itself. While surfing around eBay, trendy at the Trending eBay Deals, the BuyDig ebay store is back with the new condition 34-inch Samsung SE790 Curved Ultra Wide WQHD display offered for $600 with free shipping. Limit five per customer. This has 3440 x 1440 resolution, and various connection options (zoom in on gallery picture #4 to see them). And now a pre-order everyone has been waiting for 🙂 Dell Home is accepting pre-orders for the pixel-peepers wildest dream, the Dell UltraSharp 32 8K Monitor, model UP3218K. The pre-order price is $5000 with an April 17 shipping estimate. Monoprice is having a computer monitor sale with free standard US shipping on participating sale monitors. These are not eligible for coupon EXTRA20 (I tried a couple, it doesn’t work ~ but no one stops you from trying since it is the shopping cart the one that ultimately decides what you pay). This promotion runs until March 13 in 2017. The price you see is the price you pay. There are two ways to view them, a more visually pleasing view or a classic product listing view. If you are a bit of an adventurous shopper, and your world view is wide and slightly curved, there is currently the certified refurbished 29-inch Ultra Wide Curved Samsung S29E790C WFHD LED-backlit Monitor is offered for $310 with free shipping by Woot with the order fulfilled by Amazon. It only has three customer reviews, one is happy, one is happy but the first one was a dead-on-arrival, and the third got the wrong power cord. So there is some risk here. If you are risk averse and start fuming at the thought of having to return/exchange something, you may want to skip it. The monitor has 2560 x 1080 resolution (21:9), Picture in Picture, HDMI, DisplayPort, VESA, etc. Gallery picture #6 shows the connections on the back but it’s a small picture. 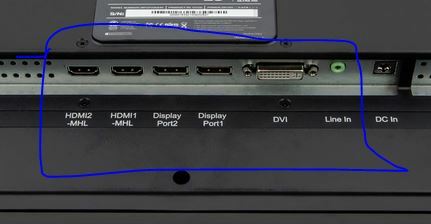 Zooming in, it looks like there are three, maybe the two are the HDMI (I’m only guessing). To the eBay Deals, if you want a monitor with multiple HDMI inputs, the official Best Buy eBay store is offering the new condition 25-inch HP T3M82AA#ABA IPS LED monitor (1920 x 1080) for $130 with free shpping or free store pickup. Limit up to three per buyer. This has two HDMI inputs and one VGA input. Back to the Trending ebay deals, if you need a bang for the buck 1080p computer monitor with connectivity versatility, the NewEgg eBay store is offering the new condition 23.6-inch Acer K242HQL 1920×1080 TN computer monitor for $80 with free shipping with a limit of up to five units per customer. Per the listing there (see also the product description pictures) this has VGA, DVI and HDMI inputs, making a good candidate for devices old and new. The Monoprice website is offering the 30-inch Monoprice IPS Monitor, Product ID 11441, for $299 with free standard US shipping when you use Promo Code IPS30 over there until 12/31/16. This is a WQXGA 2560×1600, with Dual Link DVI-D. This daily deal expired… On the utilitarian computer monitor front, the Adorama daily deal good until 11:59am ET on Friday 11/11/16 is the new condition Dell E2416Hm 24″ Full HD LED Monitor offered for $100 with free shipping and handling. This is 1920 x 1080 IPS, with VGA and Display Port inputs. This 24-hour coupon expired… If you are a fan of Dell’s Precision workstations (desktops and laptops), and refurbished computers, for 24 hours only, the Dell Refurbished Store is offering 50% off any Dell Precision Laptop or Desktop Workstation with coupon code PRECISION50 and free shipping. The promotion runs from 10/25/2016 at 9am Central until 10/26/2016 at 9am Central. If you are a fan of Dell computer monitors, they have a sale (no coupon needed) that gets you 25% off select Dell monitors with screen sizes ranging from 22 to 34 inches, with 4K and Curved Screen models included, along with Stands. Click on the red tag icon there to see them all. Sale ends 9/22/2016 11:59PM. The LG Electronics 34UM68-P 34″ Class 21:9 FHD UltraWide IPS Monitor with a 2560×1080 resolution is currently on sale for $348 with free shipping at Adorama. No coupon, no rebate, but you have to click on the Price to see the price. Offer ends by 8/13/16. While we are on the topic of computery items, the Lenovo IdeaPad Miix 700 12″ Full HD+ Touchscreen Tablet with Keyboard is on sale for $500 with free shipping. Limit one per customer. Offer ends by 8/15/16. For a limited time only, B&H Photo is offering the 27-inch Samsung 398 Series C27F398 Curved LCD Monitor for $209 with free expedited shipping. This is 1920×1080, with DisplayPort 1.2 and HDMI inputs, 72% NTSC 1976, etc. This is a newer model so not much is known about it review-wise. And now some X-Rite coupon action, B&H Photo with their trade show offers coupon BHOPTIC16 is offering the X-Rite i1Photo Pro 2 Color Management Kit for Photographers for $1300 with free expedited shipping until 6/8/16. Speaking of monitor-related matters, B&H offers the LG 34UM95-P 34″ 21:9 UltraWide IPS Monitor with Thunderbolt, model 34UM95-P, for $700 with free expedited shipping after coupon code BHOPTIC16 by 6/8/16. Dell Home is having a sale, 25% off select UltraSharp monitors, a total of 18 options are available. No coupon is needed, the price is discounted as you see it on their website. Sale ends on 6/3/16 at 8am ET. While there, they also offer the 27″ LG Electronics 27UD68PUltra HD 4K IPS LED Monitor (3840×2160, Reader Mode) for $398 with free shipping. Offer ends 5/31/16. If you are looking for a computer-monitor for photography, the 27-inch BenQ SW2700PT is available in refurbished condition for $457 at the BenQ online store. This is a 2560×1440 monitor with DVI-DL, HDMI 1.4, DP1.2 inputs, 99% Adobe RGB Coverage, 14-bit 3D LUT & Delta E≤2, 109 ppi, shading hood, low blue light mode, and more. This goes for $600 in new condition at B&H Photo where it is backordered. Thanks to one of our readers for the email alert! This ended: Speaking of monitors, there is a refurbished Samsung Monitor sale at Amazon, fulfilled by Woot, good until Sunday 3am ET, featuring three 1920 x 1080 models going $90 to $170. If you are not afraid of mail-in rebates and you are looking for a 24″ IPS monitor, Adorama has a good deal for you. It is the LG Electronics 24MP48HQ-P 24″ Class IPS Full HD LED Monitor going for $100 with free shipping after a $50 mail-in rebate (prepaid gift card). Rebate details in the PDF file which says limit two per household (two units but must be submitted in one claim). This rebate offer is good only at Adorama. The monitor is 1920 x 1080 and has HDMI and VGA inputs (see the last picture in the product gallery for a close-up of the connectors). Offer ends 5/25/16. If you are interested in HP Workstations or Computer Monitors for your post-processing and workflow and businessflow and flow-flow needs, coupon code HPPROMO (two Ps, HP and PROMO) gets you $100 off the purchase price of 53 options of such devices at B&H Photo. The coupon is a limited time offer but I do now know the exact expiration date. To the eBay Top 100 where Adorama’s eBay store has a bang for the buck monitor deal, offering the new condition 23.6″ Acer K242HQL Bbd for $93 with free shipping with a limit of five per customer. Over 270 units sold so far. UPDATE: Speaking of Tech items, the certified-refurbished Nexus 10 goes for $150 by Square Deals Inc with the order fulfilled by Amazon itself. Monoprice is having a Computer Monitor Sale featuring 18 different models (LG, HP, Monoprice, Acer, AOC, Philips) with free shipping. Monoprice has recently expanded their offerings, they carry third-party brands as well, not just their own house-brand products. This sale ends 3/28/16. In parallel, they have a PayPal co-promotion, coupon GET10 gets you $10 off a purchase of $50+ if you pay with PayPal. Some brands and products are not eligible for the coupon, but most items are. When you add the coupon to your shopping cart and click on the coupon details you will see the list of ineligible items. Or you can go to the coupon exclusion page. Bag action now at Adorama, where the Lowepro Photo Sport Sling 200 AW Backpack is on sale for $70 with free shipping. Offer ends 11/30/15 or earlier if sold out. In other Lowepro action at Adorama, also with frees shipping, you can get the Lowepro Edit 100 Bag for $7, and the Lowepro Passport Sling II Camera Bag (Black/Red) for $17. Offers end 11/30/15 or earlier if sold out. If you need that extra space on the vertical, in other words a 1920 x 1200 instead of a 1920 x 1080 (a lot more prevalent these days), the 24-inch Dell UltraSharp U2412M is on sale for $233 with free shipping at Amazon by Amazon herself. Features include IPS, VESA, physical adjustability (tilt, swivel, etc), DisplayPort, DVI-D, VGA, (no HDMI), USB 2.0 ports, etc. It averages 4.6 out of 5 based on 1200+ customer reviews and has nearly 400 questions answered by viewers like you. For the early adopters, the action continues at the eBay Deals, where Monoprice is launching their brand new 27-inch Monoprice monitor (model 13808) for $340 with free shipping. This is sold by the Monoprice eBay store (limit 5) as the featured deal of the day over there. It is a 27″ IPS 2560 x 1440 @ 60Hz (WQXGA), VGA, HDMI, and Dual Link DVI-D input, VESA, stand, built-in speakers, etc. It has no customer reviews yet, and it goes for $350 at Amazon and Monoprice’s own website. More and more megapixels means bigger screens with higher resolution can make pixel-peeing a bit easier. Or something like that. Adorama is offering the 34-inch Dell U3415W UltraSharp Curved WQHD IPS Monitor for $630 after a $70 mail-in rebate (rebate details). This mail-in rebate can only be used at Adorama. This monitor averages 4.7 out of 5 based on 130+ customer reviews at Amazon where it also has 88 questions answered by viewers like you. The monitor has a 3440 x 1440 at 60Hz resolution (21:9 aspect ratio), 3yr warranties, 178° vertical / 172° horizontal, Color Gamut (typical): 91% (CIE1976), sRGB 99% (average Delta E of<3), 1.074 Billion colors, all kinds of ports, VESA, and such. Features include QHD 2560 x 1440, 178 degree, 99% sRGB with a deltaE <3, two HDMI (MHL) ports, DisplayPort, mini DisplayPort, USB 3.0x ports (including a QC 1.2), VESA, 3yr warranty, etc. At Amazon, it averages 4.5 out of 5 based on 390 customer reviews and has 67 answered questions by viewers shoppers like you. If you are looking for a new computer monitor and planning (or not objecting) to make additional future purchases at Dell Home, they have a nice deal on their 27-inch Dell UltraSharp U2715H monitor. 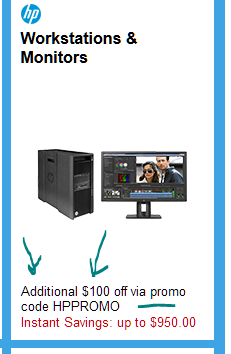 You pay $550, and for that you receive the computer monitor and 10-20 days later, you receive via e-mail a $200 promotional Dell Gift Card. 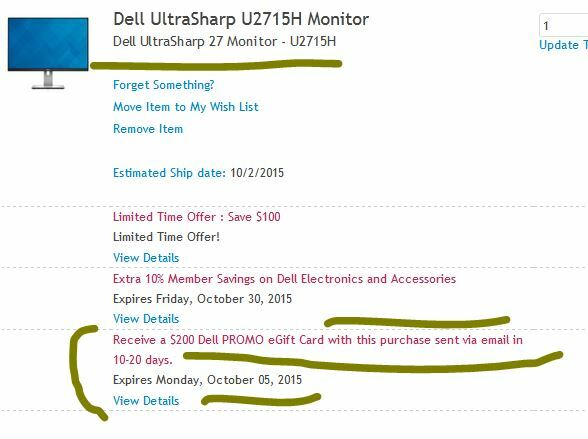 When you add the monitor to the shopping cart, the $200 promo gift card will be added automatically by the Dell website (annotated screenshot below). The promotional gift card expires 90 days after it is sent (unless your State prohibits this practice, in which case, it will last longer). So strategically, it is a good idea to plan both this and the next purchase to spend the $200 promo gift card. Main monitor specs: 2560 x 1440 @ 60 Hz, IPS, Anti-Glare, 2 HDMI, DisplayPorts, no VGA, no DVI, USB ports (five down, one up), 178-degree viewing angles, 3yr warranty, etc. Averages 4.3/5 with 10 reviews at Dell’s and 4.5/5 with 360+ customer reviews at Amazon. On the bang for the buck computer monitors front, $110 gets you the new condition 23-Inch Acer G236HL-Bbd monitor (1920 x 1080) at Amazon by Amazon itself with a limit of three per customer. Monitor action now, of the ASUS variety, and thankfully no mail-in rebate needed. It is the 27-inch ASUS PB278Q IPS computer monitor, with a 2560×1440 resolution, many inputs (HDMI, DVI-D, DisplayPort, VGA), 100% (sRGB), various adjustments (image and physical), and a boatload of cables included in the package. The connections are on the left side, not behind the monitor (you can see them in all their glory in picture #6 in the main gallery over there). It averages 4.3 out of 5 based on 875 customer reviews and has nearly 400 questions answered over there. Limit four per customer. If you are looking for a smaller utilitarian computer monitor, the 21.5″ Dell S2240M Monitor (1920 x 1080, VGA, DVI-D, IPS, no HDMI) is currently on sale for $100 with free shipping with a limit of four per customer at Amazon by Amazon herself. It averages 4.6 out of 5 with 570+ customer reviews. 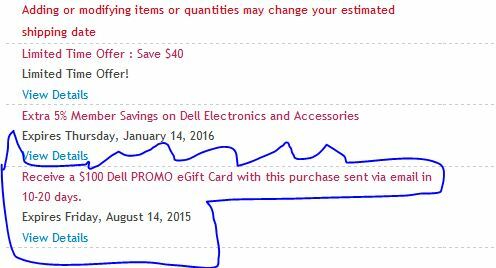 The Dell Home store has a special promotion good until 8/14/2015 at 7am Central. You pay $171 and you get the 23-inch Dell S2340L computer monitor (VGA, HDMI, 1920 x 1080, IPS) along with a $100 promotional Dell Home electronic gift code. The $100 promotional gift code will be sent to you in 10-20 days after purchase and will expire in 90 days. 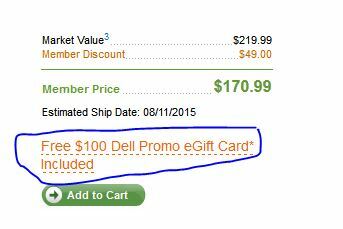 If you are not a frequent Dell shopper, you may want to plan both this purchase and the $100 promo purchase, so you don’t end up buying random things you may not need just because you have a burning promo gift card in your e-pocket. (you can see the details of the promo gift card after you add to cart and click on the “View Details” link below it in the shopping cart). You get additional benefits if you are part of their Dell Advantage program (free 2nd day shipping, extended warranty, etc).